LONDON (AP) — Soaked by the rain swirling around Arsenal’s stadium, Ole Gunnar Solskjaer watched helplessly as his dream Premier League start as Manchester United manager was brought to a halt on Sunday. After 12 unbeaten matches across three months since Jose Mourinho’s firing, United finally lost in the league under the interim manager. Granit Xhaka’s swerving — potentially wind-assisted — strike flew past goalkeeper David De Gea in the first half. 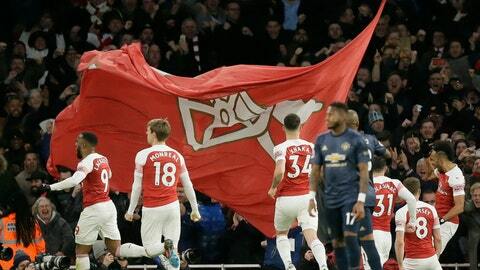 Pierre-Emerick Aubameyang netted a second-half penalty to give Arsenal a 2-0 victory after Alexandre Lacazette was bundled over in the penalty area by Fred. The title challenge is down to two teams, and Liverpool trimmed Manchester City’s lead back to a point after coming from behind to beat Burnley 4-2. “It was maybe backlash from Wednesday night,” Solskjaer said of the loss at Arsenal. In high winds and occasional driving rain, Liverpool fought back against Burnley, which took an early lead at Anfield in the sixth minute when Ashley Westwood’s corner curled straight into the far top corner of the net. On his fifth start of the season, Adam Lallana inspired the comeback with a part in Liverpool’s first two goals for Roberto Firmino and Sadio Mane. Firmino and Mane also scored in the second half, with Mane’s goal the last kick of the game seconds after substitute Johann Berg Gudmundsson had scored a stoppage-time goal for Burnley. At Stamford Bridge, Chelsea winger Eden Hazard exploited a Wolves defensive lapse to strike his 13th league goal of the season in the second minute of stoppage time to cancel out Raul Jimenez’s opener.